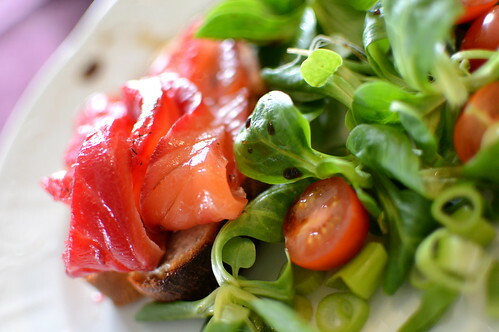 After our lovely amuse-bouches, it was time for our first course: beetroot-cured salmon. We had already served that course once for my husband’s family some time ago. 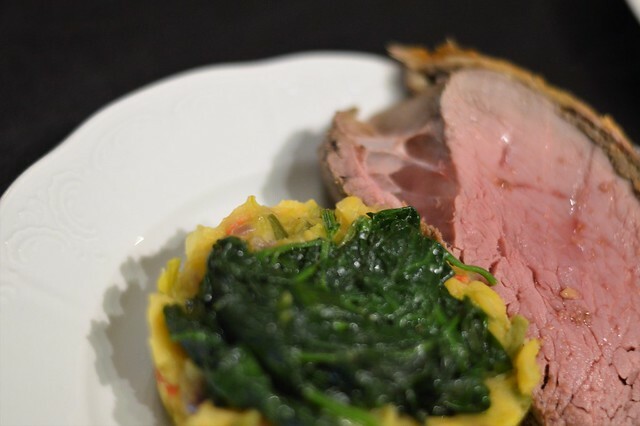 As this was so easy to make, as it was a really tasteful dish and as we would be serving it to other guests than that first time, we decided to make it once more. Here’s the link to the recipe, of which I already made a post last year. 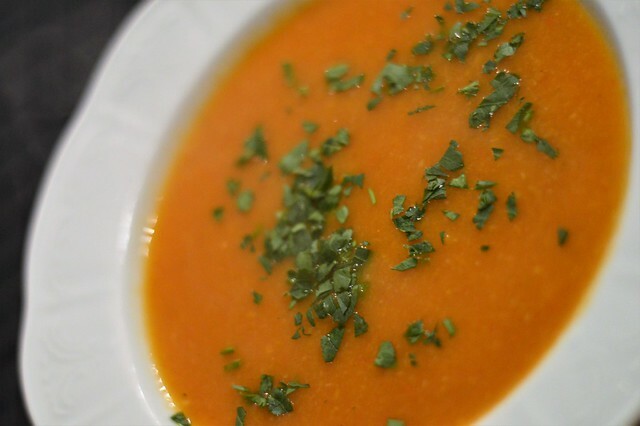 Then it was on to the second course of our menu, which was tomato and parsnip soup. Below you can find the recipe! Heat up the oil en fry the onion, garlic, parsnip and ginger for about 5 minutes on a medium high heat. 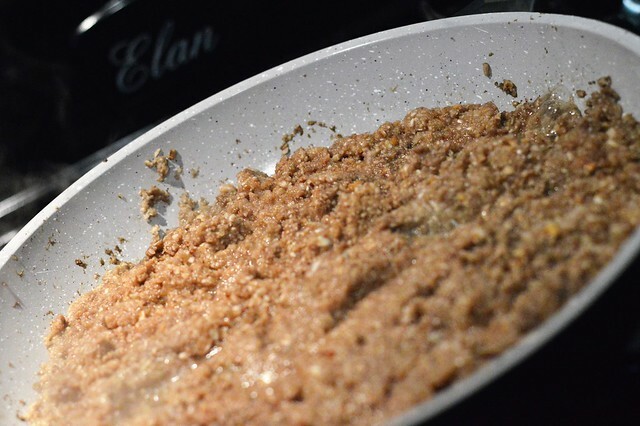 Add the tomato puree and stir for about 2 minutes on a medium high heat. Add the tomatoes, the water and the cubes of vegetable stock. Bring everything to the boil and let it simmer for about 20 minutes. Mix the soup with a blender and serve with the chopped parsley. The main course during our New Year’s Eve diner party was Beef Wellington, after a recipe of Gordon Ramsay. We had 2 pieces of beef fillet of both 1,2 kilo each, so we used one half of the ingredients for beef fillet number one, the other half for beef fillet number two! 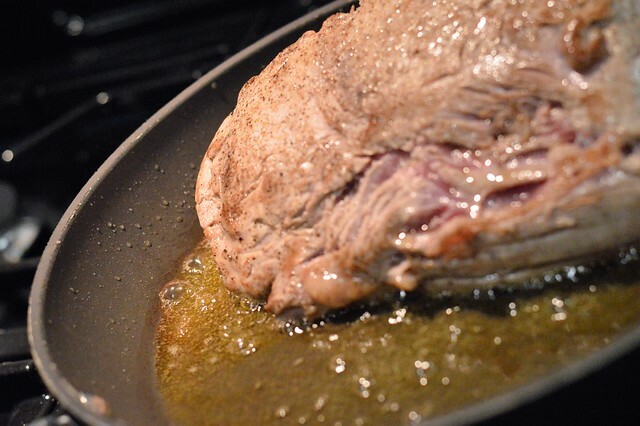 Sear the fillets of beef in a hot pan using olive oil. 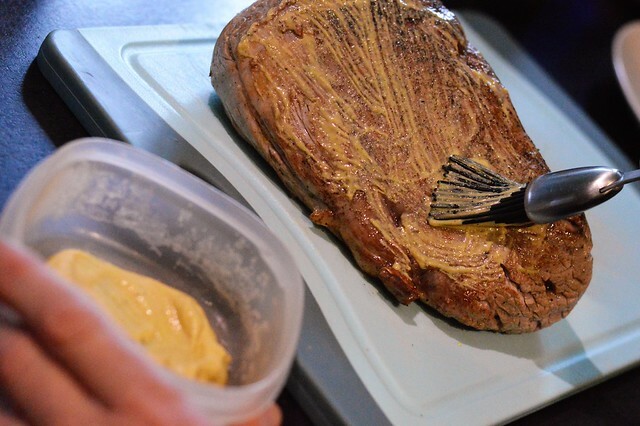 Cover the seared fillets of beef in mustard and leave to cool. Chop the mushrooms (we used a mix of plain mushrooms and wild mushrooms) and fry in a hot pan. Season with salt/pepper/thyme. The mushroom will release their juices. Cook for about 10 more minutes untill all excess moisture has evaporated. Leave the mushroom past to cool. Lay a large piece of clingfilm on your work service and place the slices of parmaham (12 per each beef fillet of 1,2 kilo) in the middle. Spread the mushroom paste on top of the parma ham. Season the beef fillets and place them on top of the mushroom-covered parma ham. 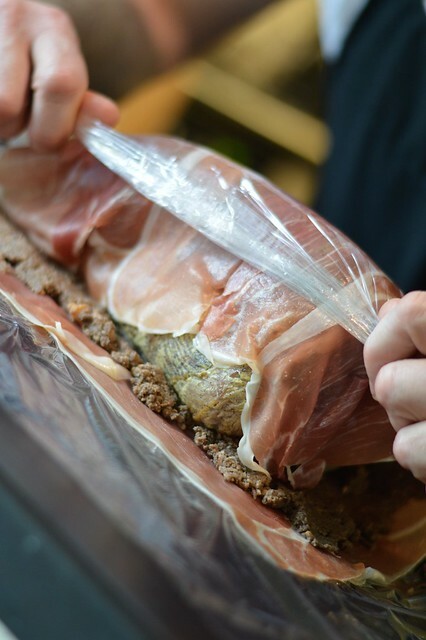 Using the clingfilm, roll the parma ham over the beef. 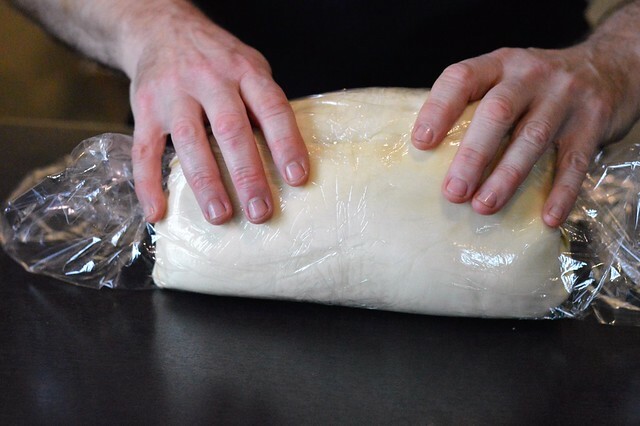 Roll and tie the cling film to create a thick log. Take another piece of clingfilm and spread the pastry on top. 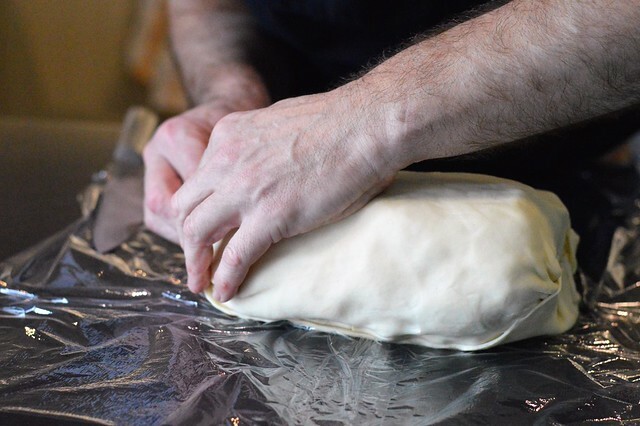 Take the beef/parma ham out of the fridge, remove the cling film and put eht beef/parma ham on top of the pastry. 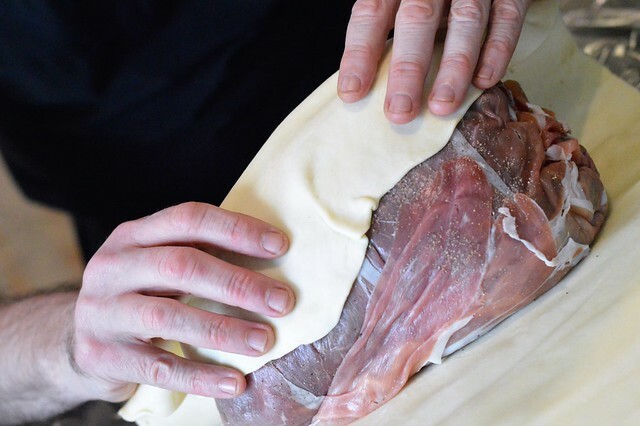 Use the cling film to roll the pastry over the beef/parma ham. Trim all excess pastry. Create yet again a thick log and cool for at least 30 minutes. 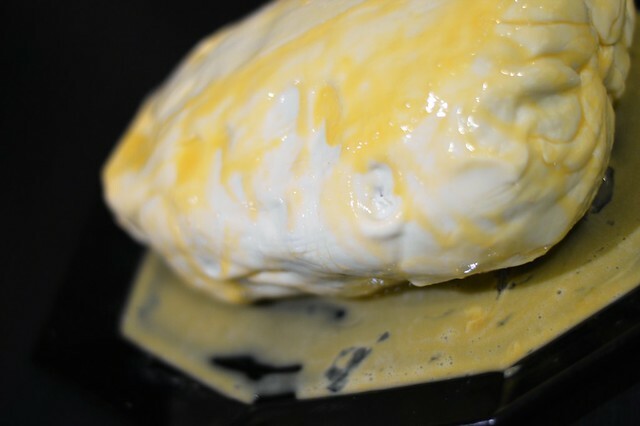 When the beef wellingtons can be cooked, score the pastry lightly and brush with the egg yolks. 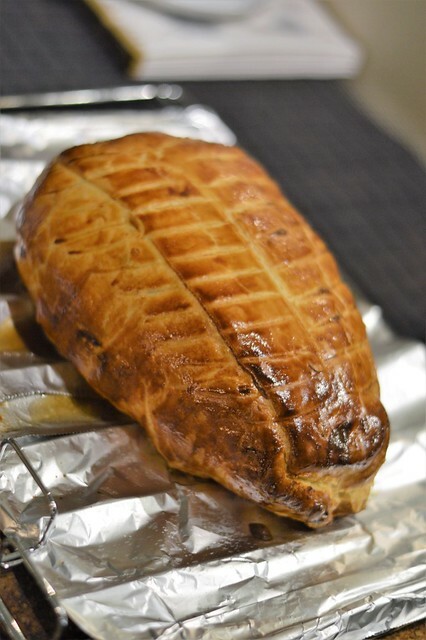 Bake at 200°C for 40 minutes (that’s the time we set to bake our 2 beef wellingtons, time may vary according to the size of the beef wellingtons). Rest for 10 minutes before carving into 3 cm slices. 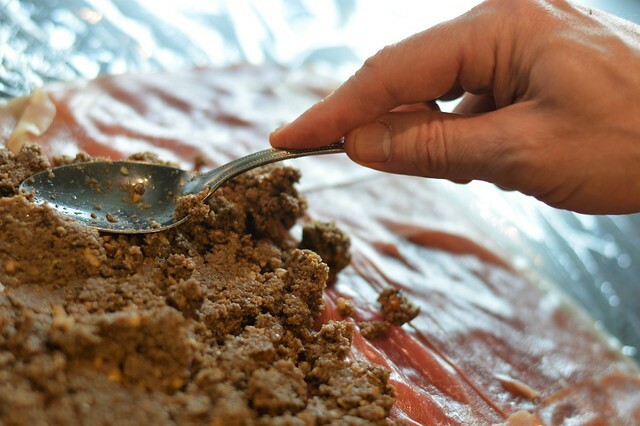 A perfect way to serve a beef wellington is with a mash. Peel the potatoes and sweet potatoes and cut in even parts. Slice the beans and leek. Slice the ginger in fine pieces. Slice the chili peppers into small pieces and remove the seeds. Cook the potatoes, the sweet potatoes, the leek, onion and ginger in water, adding the vegetable stock for about 15 minutes. Add the beans and cook for another 5 minutes. 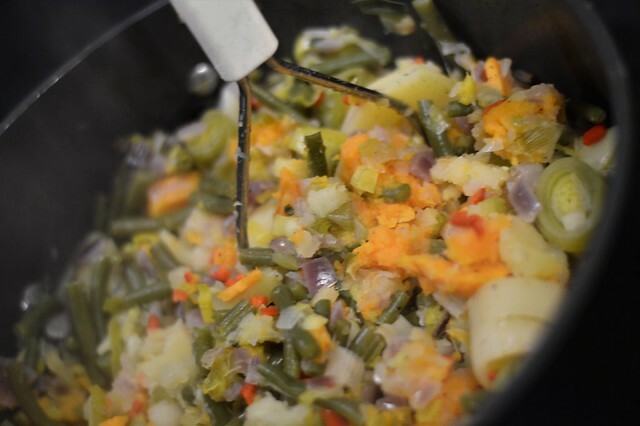 Drain the vegetables, add the white wine vinegar and chili peppers and make into a mash. 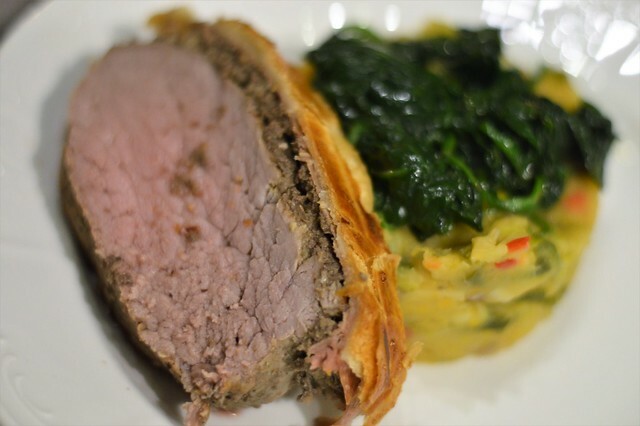 We served the mash with some stir-fried spinach, a good slice of the beef wellington and red wine sauce. This main course was devoured by everybody. 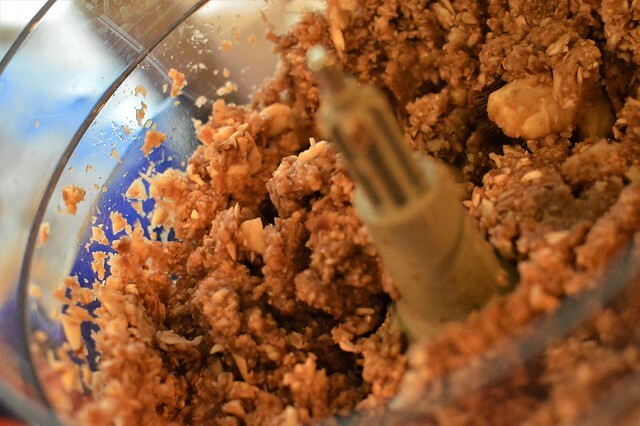 Because the mash is made without butter or cream, it is quite light. It is also very tasteful and goes really well with the beef wellington. Next week I will share with you the recipe of the desert we ate: lemon and lime cheesecake! Oh my dear god! This recipe is to die for! I cant wait to try this during the weekend! Thanks for sharing this! Will you check out my latest blog post and let me know what you think? Let me know how it went and bon Appétit!